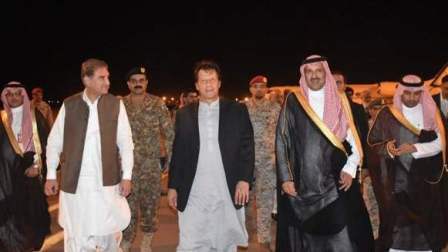 Imran Khan Prime Minister of Pakistan arrived in Saudi Arabia for participating in the investment conference. “We are desperate,” Khan said in his interview before leaving because he could not skip the conference, his concern was at Khashoggi’s death. It’s a second visit of Khan to Saudi Arabia in just over a month, but he has not succeeded in the secure way of the financial assistant to save the pending amount of payment crisis. Khan told about the Middle East Eye in an interview which published on Monday that Khan could not pass up the invitation to meet Saudi leaders again. "The reason I feel I have to avail myself of this opportunity is that in a country of 210 million people right now we have the worst debt crisis in our history," he was quoted as saying. "Unless we get loans from friendly countries or the IMF (International Monetary Fund), we actually don't have in another two or three months enough foreign exchange to service our debts or to pay for our imports. So, we're desperate at the moment." Islamabad has already asked the IMF to open discussions for the country's second possible bailout in five years. Khan took office in July, still searching the alternative way to the tough conditions the IMF is likely to execute for loans, limitation his vision for an Islamic Welfare State. The central bank's foreign reserves released this month to $8.1 billion, a four-year low and hard enough to cover independent debt payments due through the end of the year. The present account shortfall has augmented to about $18 billion. Khan has responsible the previous government's policies for the distending present account shortfall. He told the Middle East Eye that he was concerned over the "shocking" death of Khashoggi, a U.S. resident, and Washington Post columnist after he entered the Saudi consulate in Istanbul. "The last thing the Muslim world needs is another conflict. The Trump administration is moving towards one," he told the newspaper.